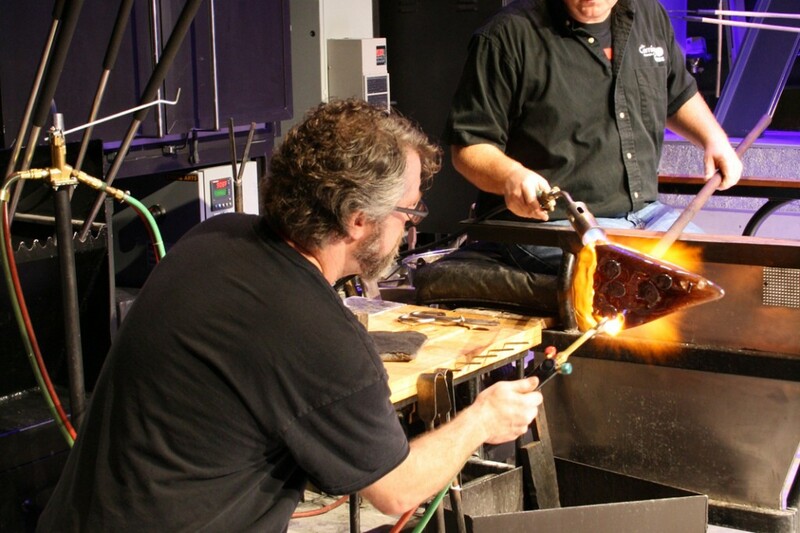 At November’s 2300°: Americana, glass artist John Miller turned the Hot Glass Innovation Stage into a glass kitchen, crafting a goblet with a cheeseburger stem and a slice of hot glass pizza. I asked him about the experience and more about his work. You’ve been to The Corning Museum of Glass before, right John? The first time I came to the Museum was in 1994 and the Libenský/Brychtová show was up and it completely blew me away. I was just driving through town as a student. And I came to the Glass Art Society conference in 2000 and was asked to come back and teach at The Studio the following summer. Visiting the Museum gives me enough inspiration to last a year; till the next time I come back and then I can revitalize myself at the Library and everything. This evening we did a cheeseburger goblet, Venetian style, that we stuck all together hot. I think it was about 12 lbs. And then we did a slice of pepperoni and bacon pizza. I have to ask – why bacon? Everything has to be decadent. The work that I make; it can’t be good for you; even the lettuce kills me to put it on, when I’m putting it on the cheeseburger. So it had to be the meat lovers special, no green peppers or anything good like that –pineapple? No way. Has to be old-school American, diner style, everything has to be bad for you. When I was 5 or 6, I used to go a drive-in diner all the time with my father and it really became part of my personality and my upbringing. When I started making more sculptural work, I started to sketch crinkle-cut fries on napkins everywhere I went and I knew I had to make the work at some point. And it really just exploded. And, it’s a little bit of social commentary on the Route 66 Americana thing. I really embraced that and the whole hot rod scene and the 50’s scene is part of the whole thing. 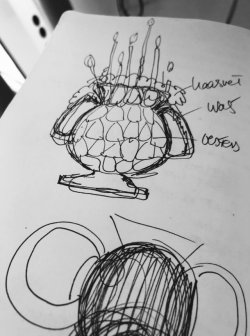 Why is glass your medium for interpreting those cultures? It was something, in the beginning, that was a challenge for me – just to try to be proficient. 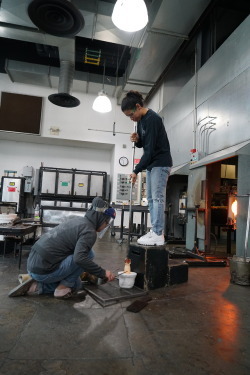 And then I started realizing with the sculptural work that I could freeze gesture and also use the color palette that glass offers in different ways than paint, ceramics, or print making offers. It’s just a way I can really replicate surfaces. Sandblast surfaces to soften them – like bread. And leave them shiny – like grease – on bacon and burgers and things like that. It’s a really versatile material for me and it’s really fun to work with. When did you get started in glass? 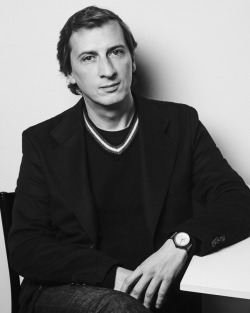 I got started in 1987 at Southern Connecticut State University, and it was just a mistake. 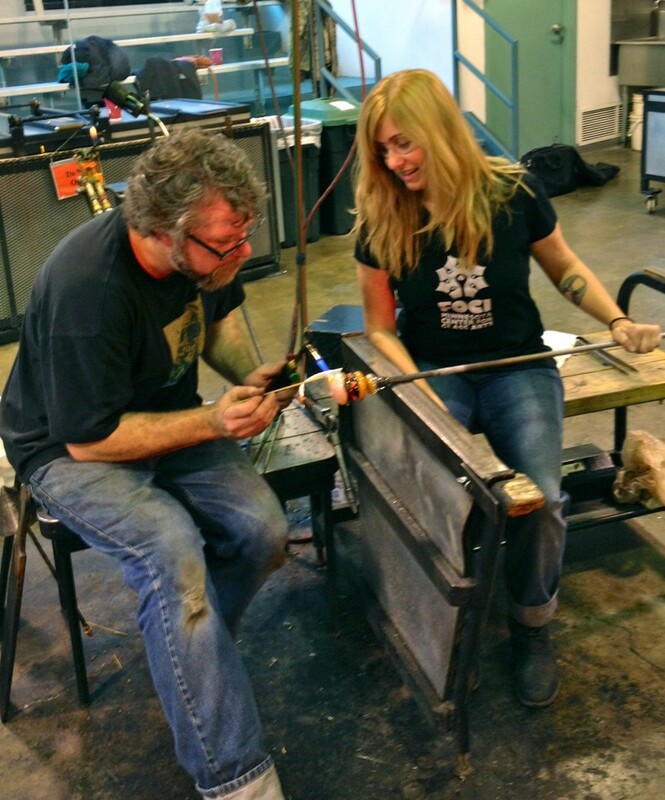 I walked into the glass studio because Bill Gudenrath was doing a demonstration. I had no idea who he was. I walked in and was blown away. I signed up for beginning glassblowing classes the next semester, and that was that; it was over. And now you’re teaching at The Studio. You have a class this week. It’s a very short three-day intensive class with six students. I’m going to scale everything down a little bit and what I’m going to concentrate on is the one-on-one. I’m going to let the students get used to the shop and then examine how they work with the material and then find out what they want to make and then help them execute that by demonstrations – it will be exciting. John Miller with Marlo Cronquist during his three-day workshop. Photo provided by Marlo Cronquist. People were pretty happy. You know, feed them some food and a few drinks and put them in front of some glassblowing and that is that. They love it. But they were yelling and screaming and clapping and we were throwing t-shirts out. I think it went well. Did anything unexpected happen this evening? Sure, we were taking off the cheeseburger goblet and it fell apart in our hands. We put it back in the kiln and it stuck back together. It happens – at least it didn’t hit the floor, but that’s more dramatic anyways! But everything else went nice and smoothly. It’s a beautiful shop, great assistants, and just a wonderful place to be in general. I like to eat cappuccino beans on my cereal. Chocolate covered. 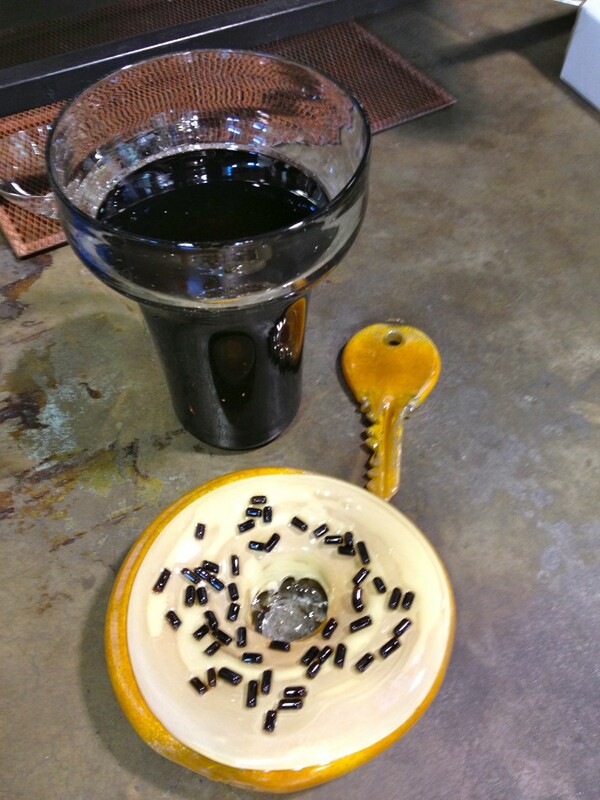 More glass from the workshop – an over-sized soda glass, key and doughnut. Photo provided by Marlo Cronquist.